Have you ever heard of Analysis Paralysis? Analysis Paralysis is incredibly common and gets in the way of success time and time again. But how do you know if you have it? Diagnosis: You have Analysis Paralysis! Analysis Paralysis is where you can’t make any forward progress because you bog yourself down in details, tweaking, brainstorming, research and… anything but just getting on with it. 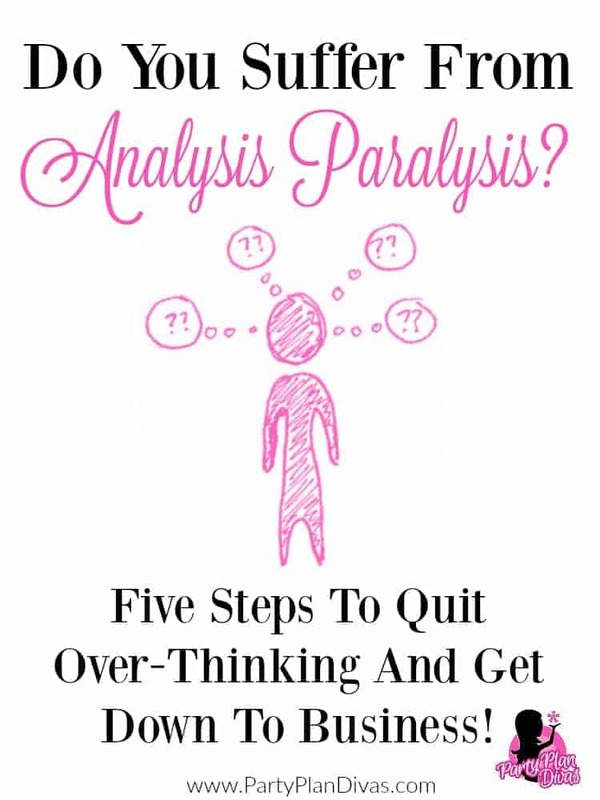 According to Wikipedia the term “analysis paralysis” or “paralysis of analysis” refers to over-analyzing (or over-thinking) a situation, so that a decision or action is never taken, in effect paralyzing the outcome. I am guilty of this “disorder” and if you suffer from these same “symptoms” here is how to overcome them, and move towards the success you deserve. What exactly IS the task you are over analyzing? I understand wanting to do something well, and wanting to do it right, but do you REALLY know what that even looks like? What are the most painful items to change after the project is finished? Set deadlines not only on the completion of the project but also on key decisions to help prevent slippage throughout the process. I like to think of them as “mile markers” to kind of chart your progress and make sure you are on the right track. Plus it helps to keep you motivated when you have a shorter term goal – so you see success more quickly. Do your best to stick to the goals and timelines you’ve established. If you have to push a date back, do your best to make a plan for how to get caught back up, instead of extending the entire project. Most of the time when you begin over thinking, you have lost touch with the burning desire for the RESULT of your project. If for instance your “why” is to quit your job to be home with your children full time, think about the things you are missing RIGHT NOW because of your paralysis. School projects? Moms Day at Lunch? Maybe baby’s first steps? Get in touch with your reason WHY you are working this project in the first place, and use that desire to help push you forward. How many times have you said to your children “Nobody’s perfect” yet you try to ALWAYS make everything perfect? Perfection is a MYTH! Give it up! Do your best – that is as “perfect” as you will ever get. DECIDE to do it. Easier said than done, right? I understand. But it is critical. You must make the decision to stop overthinking, stop overworking the “little stuff”, stop putting off the REAL tasks, and get down to the business of succeeding. Remember – to get what you have never gotten, you must do what you have never done!